Apache HADOOP is a framework used to develop data processing applications which are executed in a distributed computing environment. Similar to data residing in a local file system of personal computer system, in Hadoop, data resides in a distributed file system which is called as a Hadoop Distributed File system. Processing model is based on 'Data Locality' concept wherein computational logic is sent to cluster nodes(server) containing data. This computational logic is nothing but a compiled version of a program written in a high level language such as Java. Such a program, processes data stored in Hadoop HDFS. HADOOP is an open source software framework. Applications built using HADOOP are run on large data sets distributed across clusters of commodity computers. Commodity computers are cheap and widely available. These are mainly useful for achieving greater computational power at low cost. Do you know? Computer cluster consists of a set of multiple processing units (storage disk + processor) which are connected to each other and acts as a single system. Hadoop MapReduce : MapReduce is a computational model and software framework for writing applications which are run on Hadoop. These MapReduce programs are capable of processing enormous data in parallel on large clusters of computation nodes. HDFS (Hadoop Distributed File System): HDFS takes care of storage part of Hadoop applications. MapReduce applications consume data from HDFS. HDFS creates multiple replicas of data blocks and distributes them on compute nodes in cluster. This distribution enables reliable and extremely rapid computations. 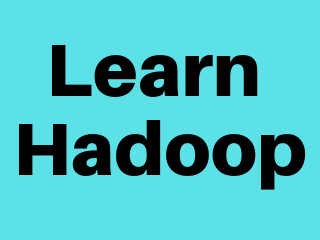 Although Hadoop is best known for MapReduce and its distributed file system- HDFS, the term is also used for a family of related projects that fall under the umbrella of distributed computing and large-scale data processing. Other Hadoop-related projects at Apache include are Hive, HBase, Mahout, Sqoop , Flume and ZooKeeper. As Big Data tends to be distributed and unstructured in nature, HADOOP clusters are best suited for analysis of Big Data. Since, it is processing logic (not the actual data) that flows to the computing nodes, less network bandwidth is consumed. This concept is called as data locality concept which helps increase efficiency of Hadoop based applications. HADOOP clusters can easily be scaled to any extent by adding additional cluster nodes, and thus allows for growth of Big Data. Also, scaling does not require modifications to application logic. HADOOP ecosystem has a provision to replicate the input data on to other cluster nodes. That way, in the event of a cluster node failure, data processing can still proceed by using data stored on another cluster node. Topology (Arrangment) of the network, affects performance of the Hadoop cluster when size of the hadoop cluster grows. In addition to the performance, one also needs to care about the high availability and handling of failures. In order to achieve this Hadoop cluster formation makes use of network topology. Typically, network bandwidth is an important factor to consider while forming any network. However, as measuring bandwidth could be difficult, in Hadoop, network is represented as a tree and distance between nodes of this tree (number of hops) is considered as important factor in the formation of Hadoop cluster. Here, distance between two nodes is equal to sum of their distance to their closest common ancestor.